Now I’m not so sure we would have gone a long way out of our way to visit a touristy ghost town. This one was just twelve short miles from the RV park we were staying in Barstow. We had read about it before and thought it was a perfect time to visit. That’s what we did on Friday. If you're interested, you can click to enlarge the map and information. The place is huge. In 1881 this town came into existent with the largest silver strike in California with over $20 million worth of silver being mined. It was a booming town. The town had 500 mines and folks came from all over hoping to strike it rich with the silver coming out of this place. Some did and some didn’t. When silver lost its value in the mid-1890's, Calico lost its population. The miner's packed up, loaded their mules and moved away abandoning the town and the dreams of richness. It became a "ghost town." We weren’t here to look for wealth. After all, we were a little late for that. Some of the abandoned buildings have been restored. They have just about everything to entertain folks and bring them in. There’s even an RV park on property with admission to the ghost town included in the price of the nightly fee. Stone houses were built over individual mine entrances. They lived in the homes and protected their claims at the same time. Calico Ghost Town has also been the setting for several wild west and Disney movies. I mentioned the other day my cousin was a trainer for Disney. He was in Calico during the filming of one of Disney’s movies. His job was to take care of the cougars that were used in the movie they were making. The weather was perfect and we entertained ourselves scoping out the town, taking a train ride and having lunch. Now we can say …… been there, done that. On the way back we passed by the McDonalds at Barstow Station. Had we not already had lunch we probably would have stopped here. It’s definitely different from all the other hamburger places we’ve seen. We've never seen a McDonald's in a train car. We made one more stop. This time it was to take a look at this monster of a tank. The tank was used during the Vietnam War. He’s smiling at you … well, kind of. It was time to think about getting back on the road again. Saturday was the planned day. The winds were so strong Friday night they kept us awake as we rocked and rolled. About 2AM the wind was still blowing strong. We made the decision then to just stick around another day. Saturday definitely wouldn't be a travel day with winds like that especially since the Tehachapi Pass was right in front of us. 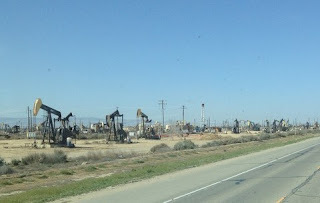 Did you know there were oilfields in this part of California? Things changed though when I woke up at 5 AM and the super strong winds had moved along. It looked like that original departure time was back on schedule. According to our favorite weather website, it looked like the best time to hit the pass was between 9 and 11 AM. That was our window. We figured we could be through the pass and even have Bakersfield behind us by then. We were hoping we were right. As we approached Tehachapi the roadside warning sign was lit up indicating super strong winds were ahead and travel was not recommended for RVs. We were sure the sign was still lit from the night before. We also knew later in the day that sign would also be necessary. Needless to say, we were happy to have the pass behind us. A little after 1:00 we pulled into our new spot at Camp Roberts on Hwy 101. For $10 we had full hookups and a great site. The terrain had definitely changed, the sun was shining and I took a long nap. We could even feel a little bit of that ocean air. Things are certainly changing. On Thursday we left the Parker, Arizona area. It was hot! The temperatures were expected to push 100 degrees. It seemed summer was arriving much earlier than normal and we didn't have any interest in sticking around. We have taken many different routes to and from Arizona. In our opinion there is nothing scenic about this route. It seems we were constantly either climbing or descending. On the plus side though the roads were good and the traffic light. Are we sticking to our two-two-two plan? Our arrival time was before 2:00 PM and we drove 250 miles but we're not staying two nights. This is just a stop off. We're still heading a little farther north before we settle in for a bit. One thing about traveling through this part of California in March ... there is no snow and the weather can certainly be nice (or not). Looks like a great week...sure hate those strong winds. Safe travels. Pretty good travel days and you made it thru the pass, just enjoy the trip is the best way todo it. We've been lucky so far - not too much wind. And it's finally cooled back down into the 80's which is wonderful. Safe travels. Wish we'd seen that McDonald's when we went through there. We would have made an excuse to stop. It did get into the upper 90s three days here in Parker but back into the 80s for today. Sure glad to have power for A/C those three days. You were wise to miss it. And it's hot here in Overton, high 80's from about noon until dark. It was 67* at 7:30 am when we went for a walk. Sure glad I didn't have my shower until afterwards. Ah ha ha ha! I knew you couldn't do it: 2-2-2! Not that I would even try. Glad to hear you made it over the pass with no strong winds blowing you around. Those things are very dangerous for us RVers. We are having high temps here too. Just thankful for the AC. When we lived in California and used to go to Las Vegas, that MC Donalds was a stopping point for us. The railroad car is the seating area. $10 for FHUs. What a deal. Those winds would have made very nervous. I am not sure we would have ignored that sign. We missed Calico. Looks like a really cool town. We spent a week in Barstow and still didn't run out of things to do. We took our truck on one of the dirt roads surrounding Calico Ghost town. Bad idea! It WAS an adventure though!